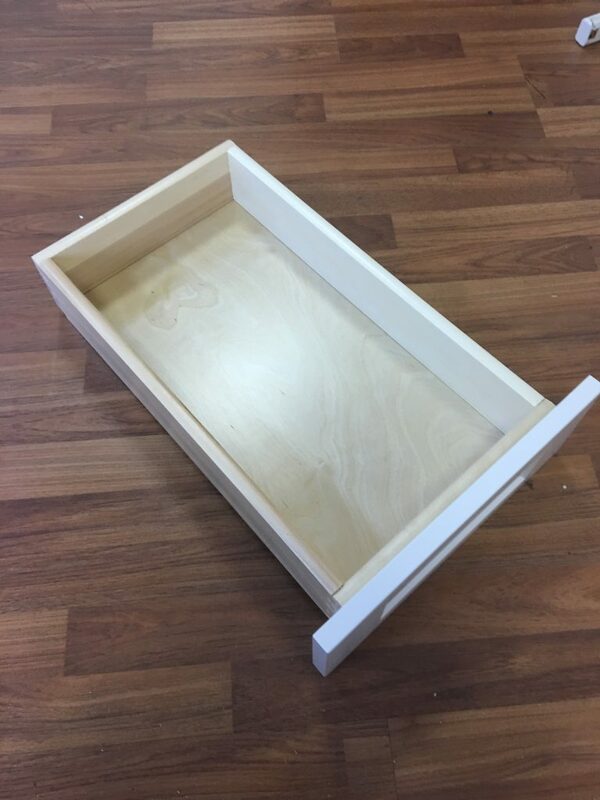 On the workbench today is the Frosted White Shaker base 15-inch cabinet from RTA Cabinet Store’s online supply. 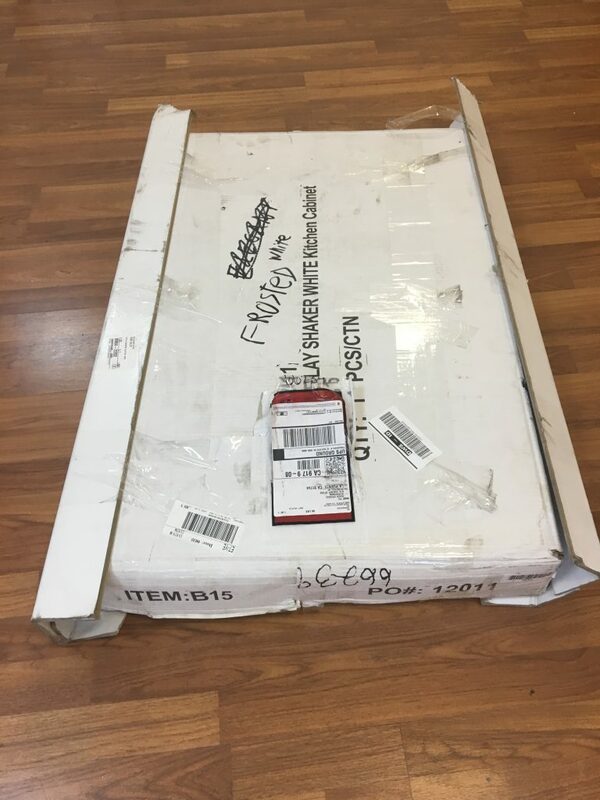 I placed the order for this unit just under a week before its arrival so it came within the estimated shipping time of five to seven business days. Immediately of note with the Frosted White Shaker is the unique and thorough packaging of this unit with special consideration to the door, drawer face, and cabinet frame (Picture 1–below, left). Thick plastic encases the face of this cabinet, which is composed of a combination of hardwood and HDF (high-density fibreboard). 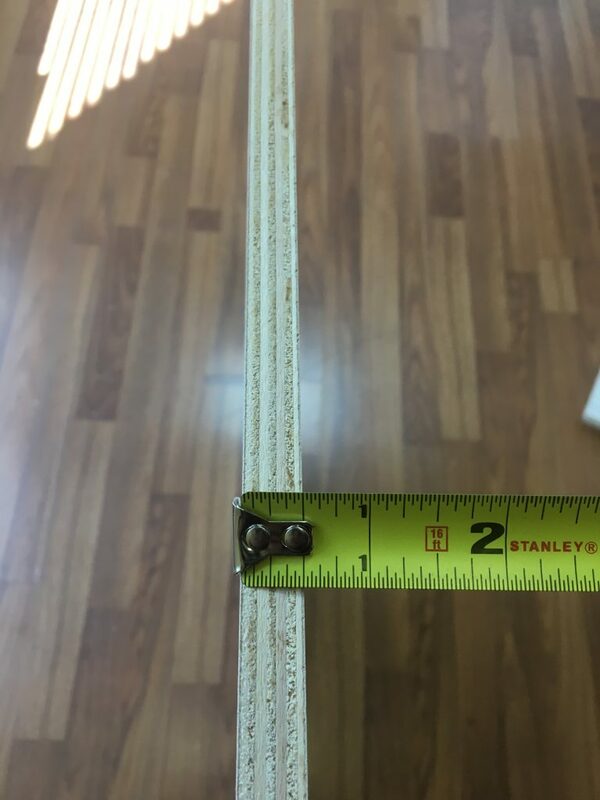 Upon removing the plastic wrapping, I am surprised to find some minor damage to the inside of the hardwood frame, given the elaborate lengths taken to protect the cabinet (Picture 2–below, right). 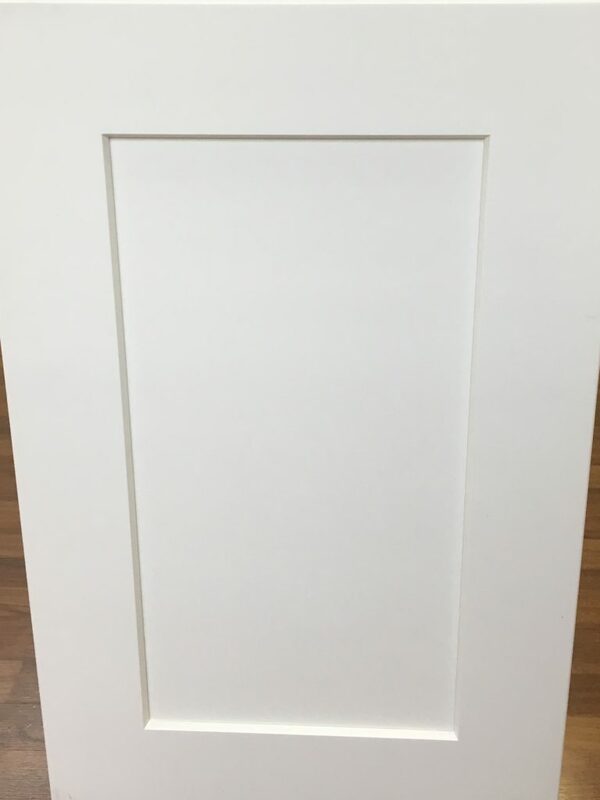 The door and drawer face of the Frosted White Shaker, both of which boast full overlay on the cabinet frame, is a classic five-piece cope and stick shaker style door with a slight bevel to the door frame leading to the center panel. This center panel is made from High-density Fibreboard (HDF), which holds the integrity of paint and finish ideally as well as resists warping due to humidity. A hardwood door is preferred as the quality of the material is stronger and has a longer lifespan than the composite MDF and HDF doors. 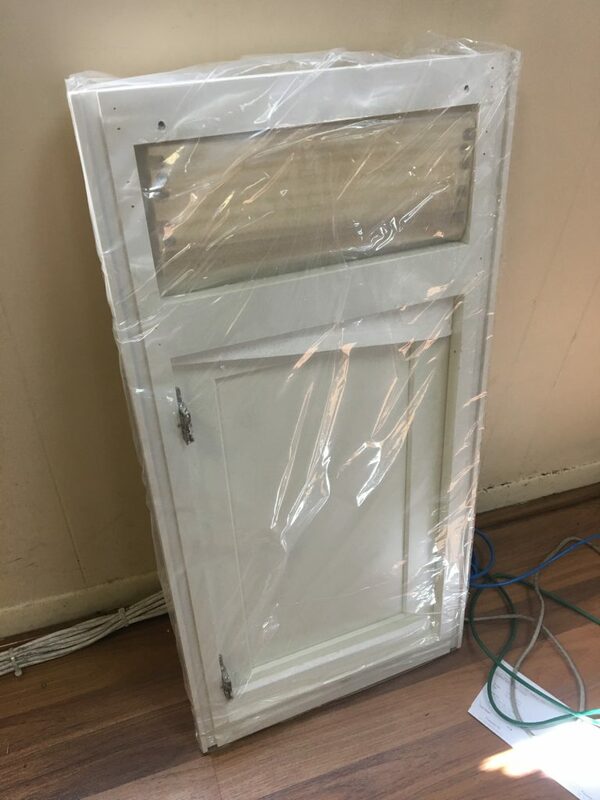 Given the fact that this door is made of HDF, the paint is evenly applied and thick with a smooth finish on both sides. 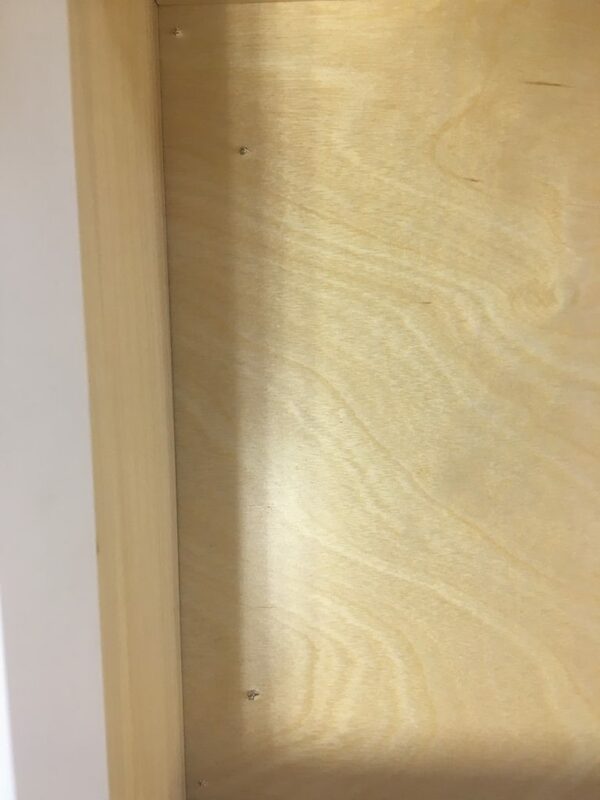 No visible cracks or wood grains can be seen on the door. The hue of white this paint job has as its finish is just slightly off from a pure white, leaning more towards an eggshell white (“frosty” is an adjective that comes to mind). 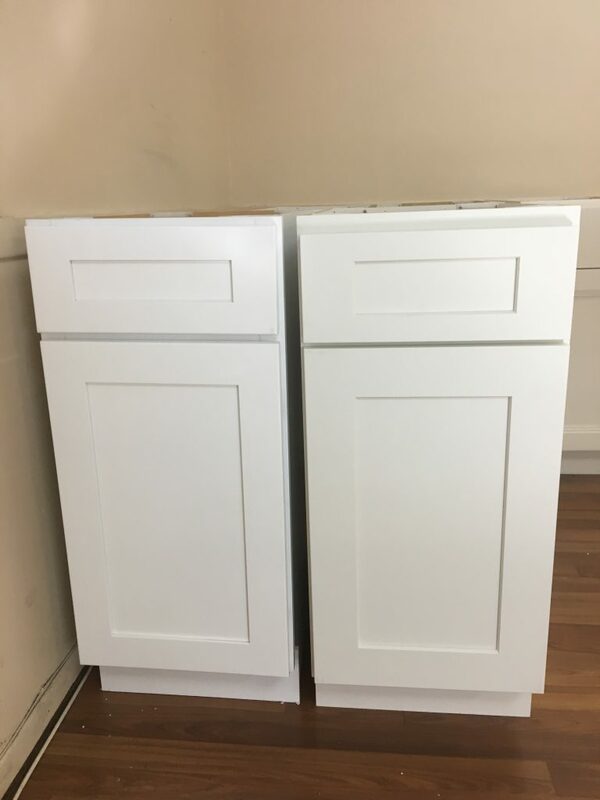 This is only evident under a bright overhead light, and overall the cabinet appears to possess a solid, sleek white paint and finish (Picture 3–right, where the bevel of the door frame can be seen surrounding the center panel). 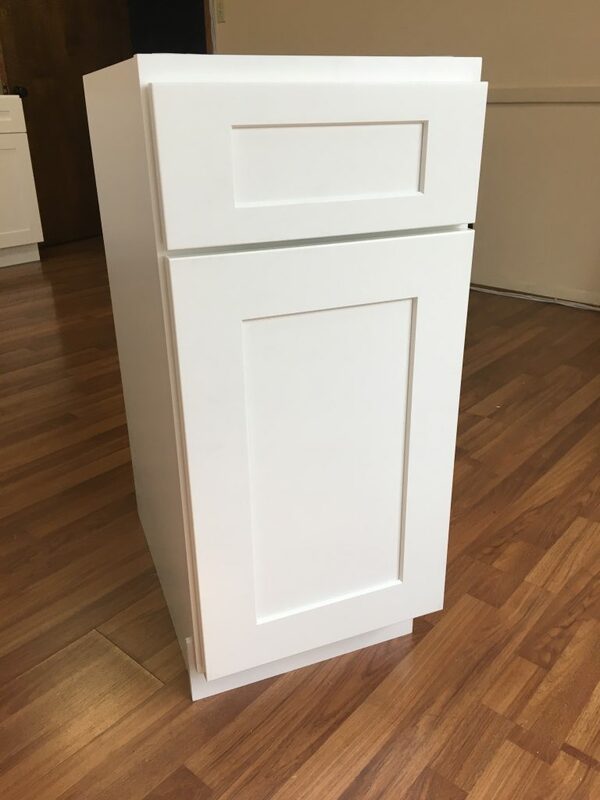 To match the exterior “frost” white paint of the unit, the interior of the cabinet is stained to match and finished with a sleek laminate to protect the plywood (Pictures 4, 5). 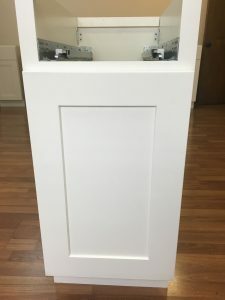 The side panels, bottom panel, floating shelf, and the metal hardware connecting the box pieces together all share the same matching white paint finish—thus giving the interior of this unit a consistent and sharp look. The first characteristic of the box to attract my attention is the full back panel as opposed to the industry standard picture-frame recess back panel (Picture 6–left). This is rare for B15 White Shaker cabinets and indicates quality cabinet manufacturing. 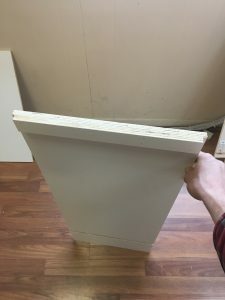 Along the top of the full back panel is a 1.5-inch tall strip of plywood coping, coming just 1/8 inch short on either side of the back panel and giving the top of the back panel a full 1-inch thickness (Pictures 7–right, 8–below, left). 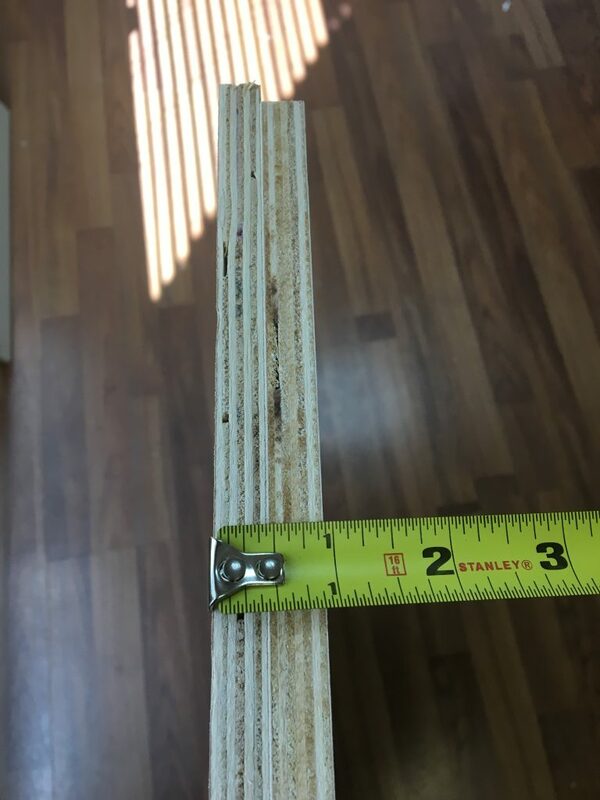 The plywood itself is of decent quality, feeling sturdy at ½ inches thick and bearing few discrepancies with no noticeable warping (Picture 9). 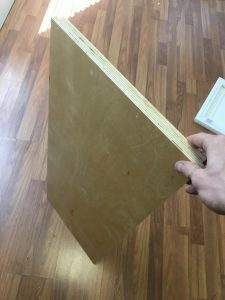 Although the plywood is high quality the thickness of the panels, unfortunately, brings the score down due to the instability it presents for the unit as a whole. The Frosted White Shaker’s drawer box is a bit of a mixed bag. 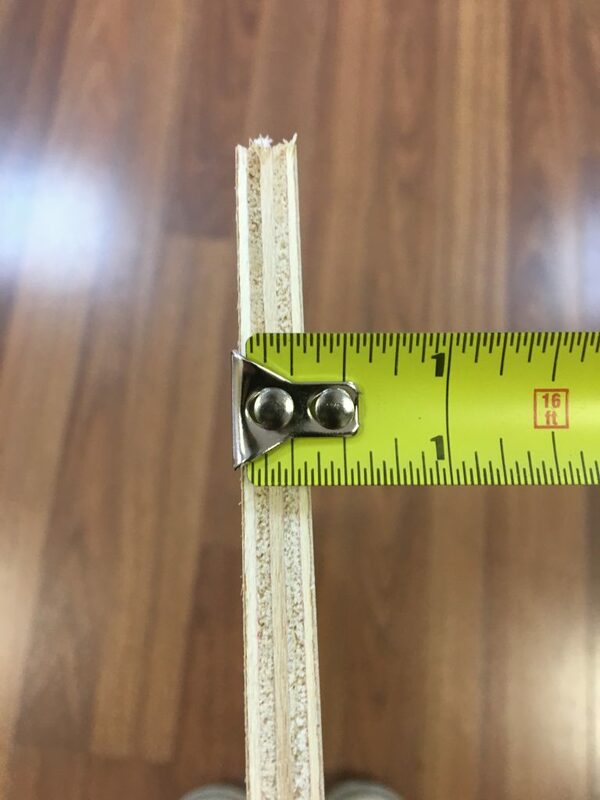 While touting industry standard panel thickness, with a bottom panel measuring 3/8 inches and side panels at 5/8 inches (Pictures 10, 11–below, left and center), along the tops of the side panels is an arched-top molding. The awkward nature of these arched-top panels is most evident at the corner joints where the dovetailing holds the structure of the drawer box together and the arches meet perpendicularly, causing a ridge at the top of the joint (Picture 12–below, right). 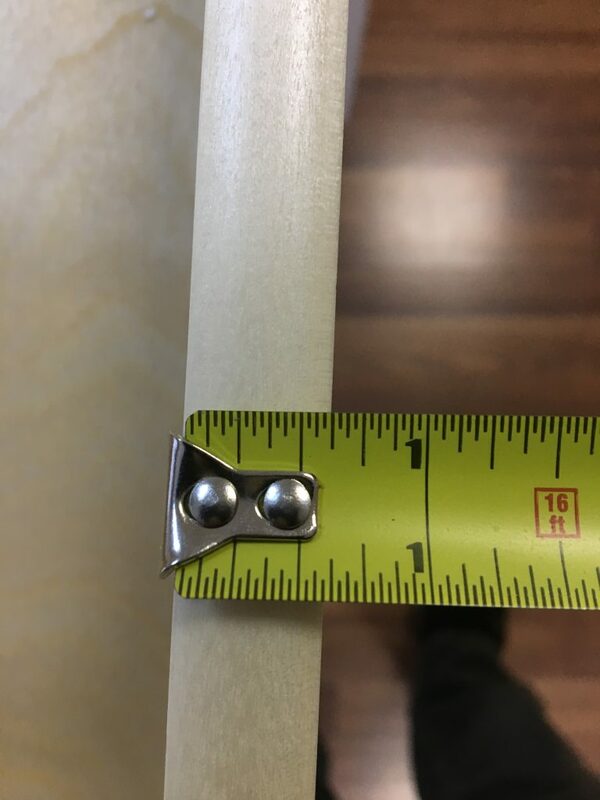 Small details such as this, while they may seem insignificant, illustrate a lack of attention to the quality of the product both aesthetically as well as structurally. The interlocking teeth of the dovetailing is relatively strong but can still be forced apart with the exertion of enough force. 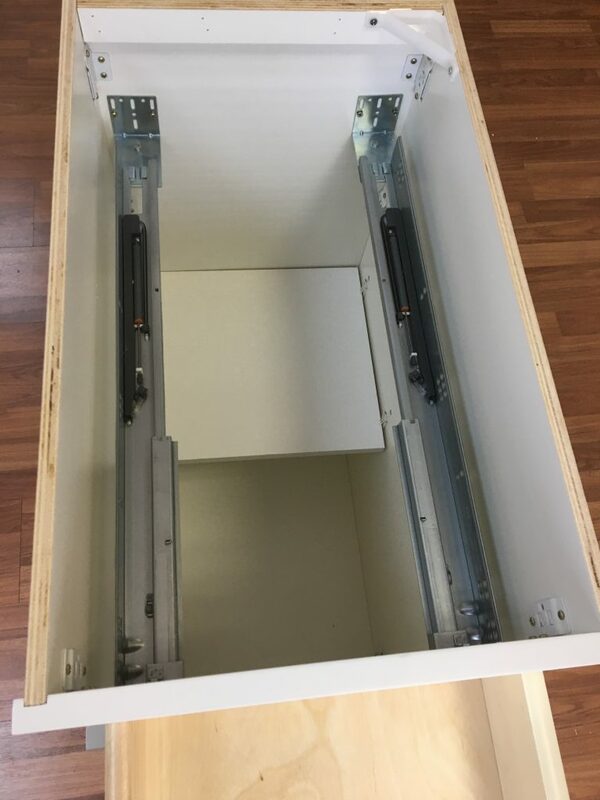 A major disappointment I have come across is the hardware provided to attach the drawer to the track glides is too long given the thickness of the bottom panel. The ends of the screws, which came with the plastic clips sealed in a separate bag from other hardware, can be seen in (Picture 13–left) rising up slightly through the finishing of the panel, which can prove dangerous when removing items from the drawer. Lacking a frameless cabinet face, the storage offered by the Frosted White Shaker cabinet is still industry standard by definition. 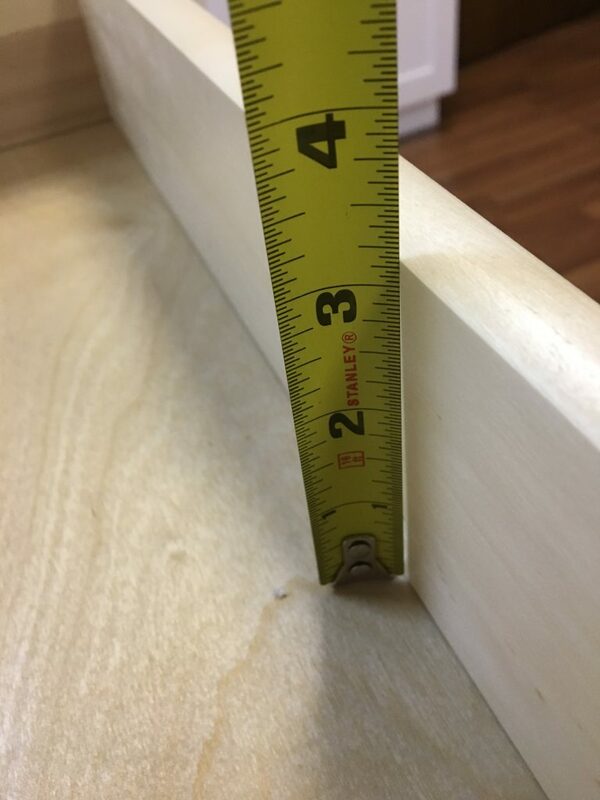 Drawer box depth is just over 3 inches and full extension, maximizing the space the sub-standard quality drawer offers (Pictures 15, 16, 17–below: left, center, right). 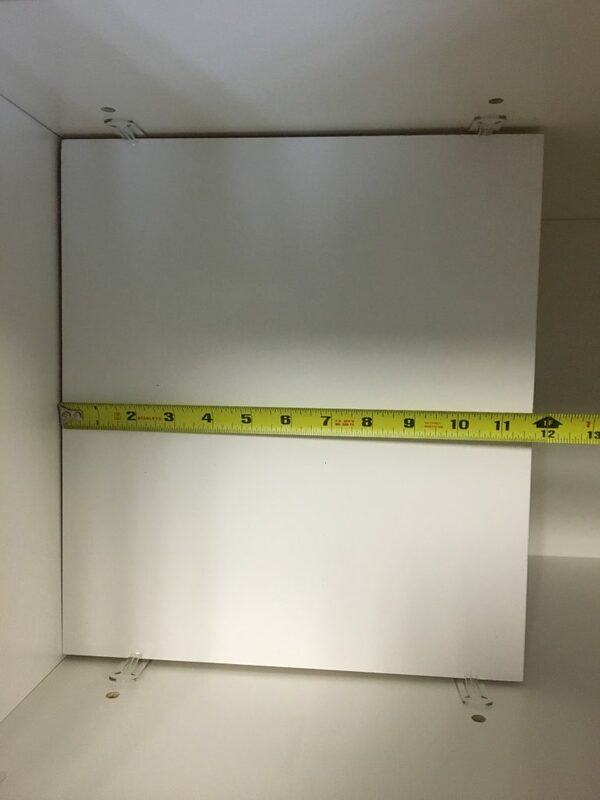 The floating half shelf measures shy of 11 ¾ inches long, so there is copious amounts of unused space in the unit that goes to waste. 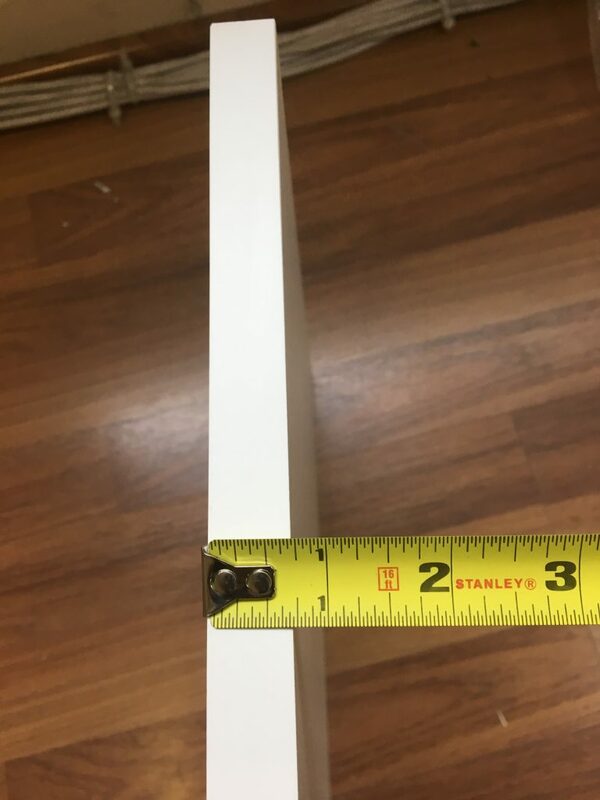 The shelf itself, while short in length, is ¾ inch thick with a very nice white finish on three sides enabling it to be flipped over after experiencing regular wear and tear (Pictures 18, 19, 20–below: left, center, right). 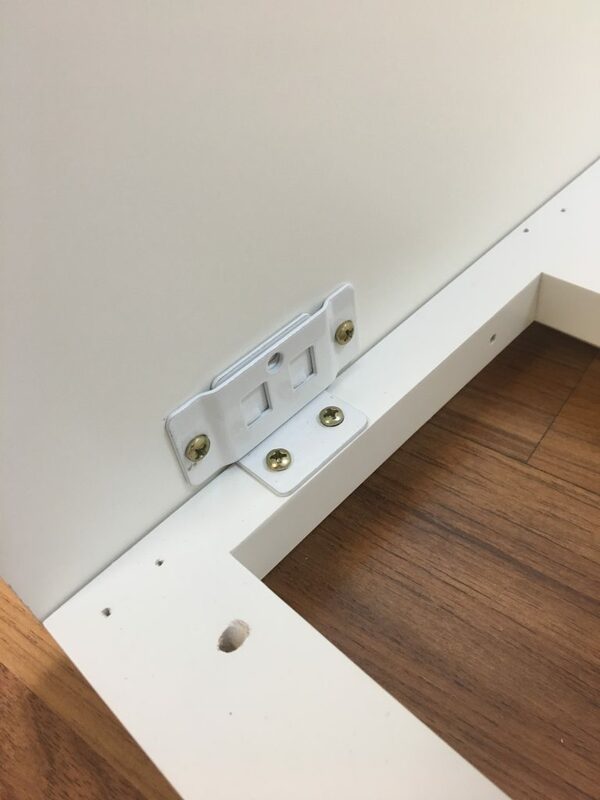 The shelf is held in place by four plastic clips that are adjustable in height (Picture 21–right). These clips are fragile in nature but easily replaceable. 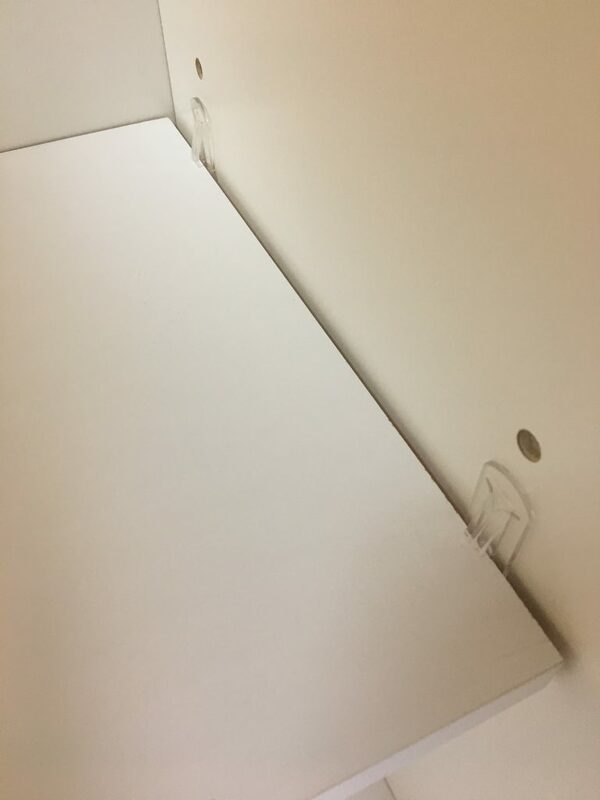 In order to fix the floating shelf in place, the clips need to be aligned just perfectly and it can be admittedly frustrating and time-consuming to accomplish this. 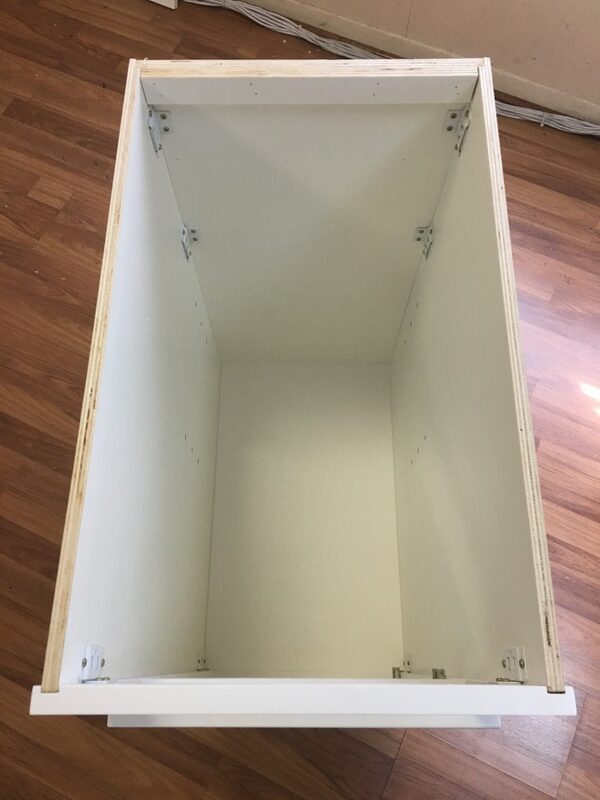 So while the majority of the interior storage ability of this cabinet is pleasing to the eye, the functionality of the shelf and structural integrity of the drawer box cause it to be docked in grade. The hinges, coming pre-attached to the cabinet frame and door prior to shipping, boast the Soft-close mechanisms that have become industry standard (Picture 22–below). 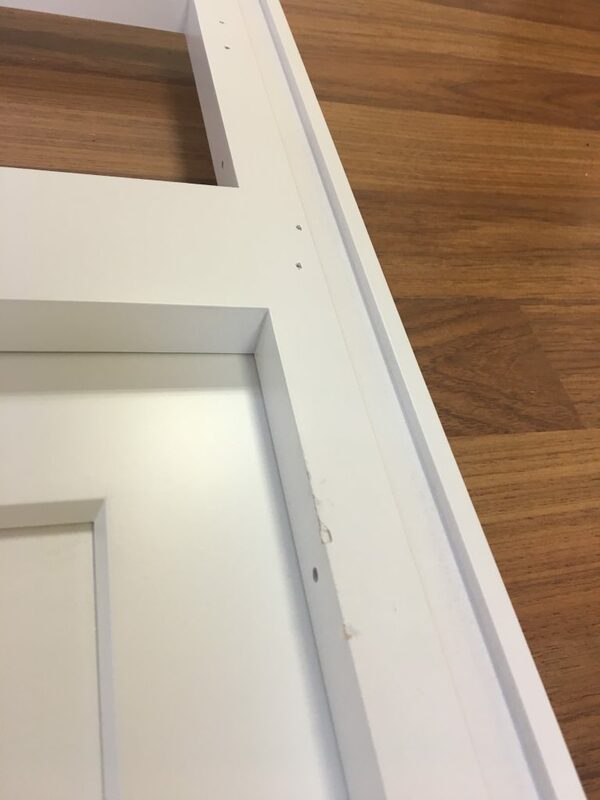 The frame has pilot holes on the opposite side of the frame in the event a door needs to be switched to the other side, and can be adjusted to ensure the door is level and even with the drawer face for a full overlay of the unit’s front. 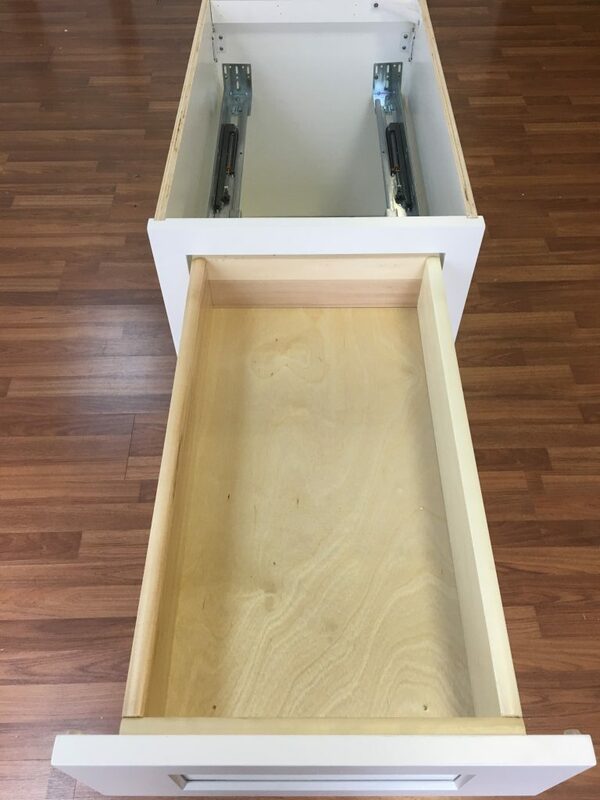 Full extension under mount drawer glides, equipped with SCMs, comes with the Frost White Shaker cabinet (Picture 23–below, left). These metal drawer glides are considered industry standard but are worth noting because several white shakers I have assembled come with a weaker epoxy set of glides. These glides attach to the drawer box via plastic clips on the bottom panel (the same aforementioned ones with screws protruding up through the wood in Picture 13). 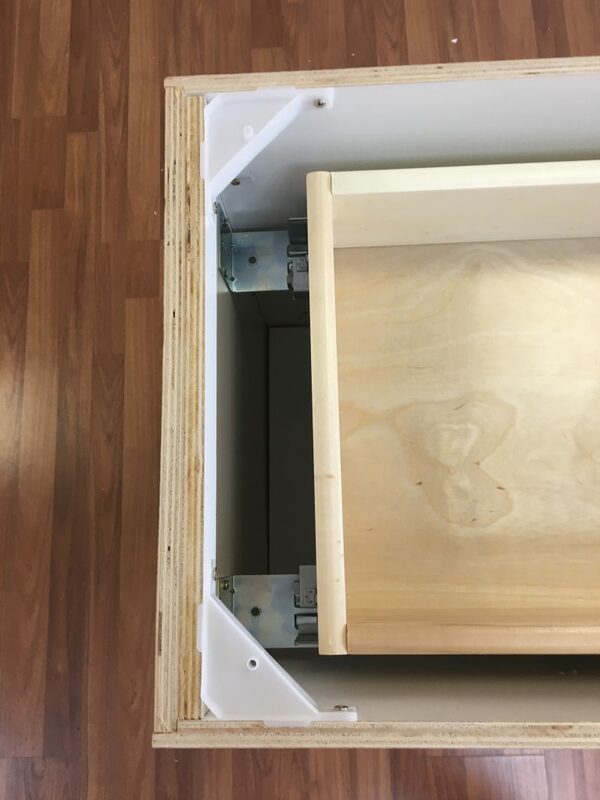 The back panel of the drawer box has pilot holes to receive the small metal pegs that hold it to the glides, which attach to the front of the cabinet body through wood screws fixing the tracks to the hardwood frame (Picture 24–below, center). 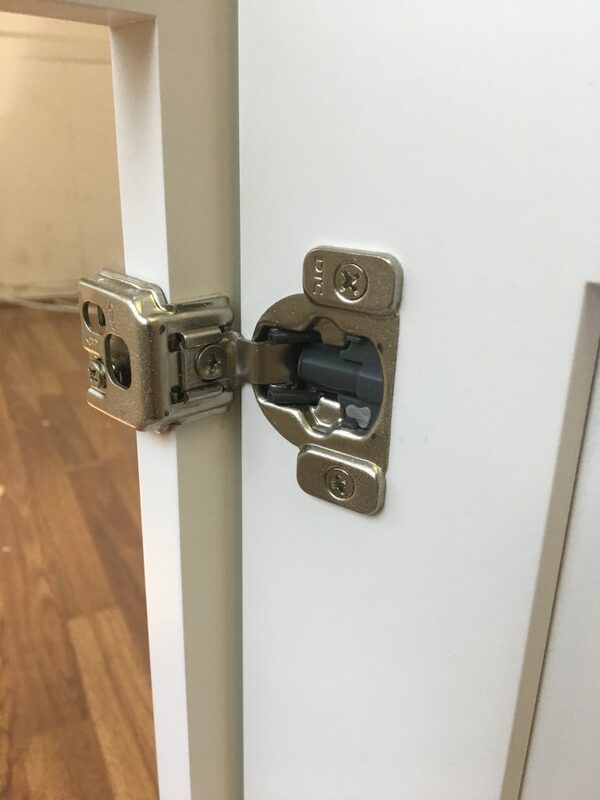 The real attribute the Frosted White boasts which I have yet to see in a cabinet is the use of metal anchors attaching the drawer glides to the body of the unit (Picture 25–below, right). 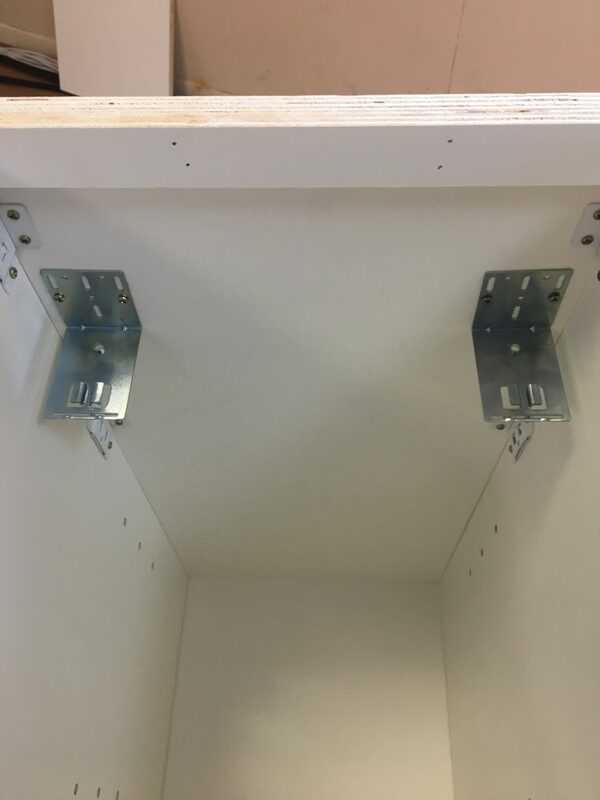 This is the first time metal drawer glide anchors have come across the workbench, and I have to say they are impressive compared to the plastic anchors found in other cabinets (Picture 26–left). Connecting the side panels to the cabinet frame and back panel are a series of “L” brackets, all painted white to match the interior and exterior of the cabinet (Picture 27–below, left). 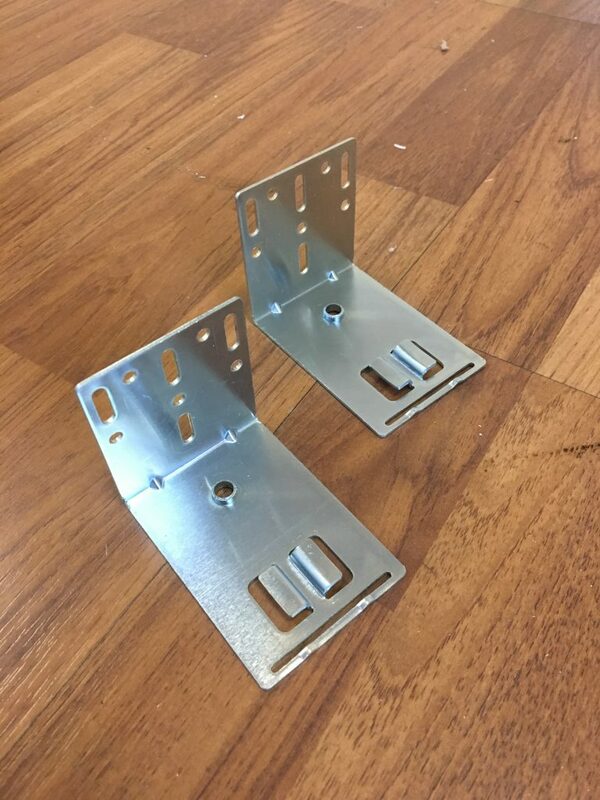 These brackets clip into place and hold the unit together quite sturdily. For added stability, plastic corner braces are included (Picture 28–below, right). 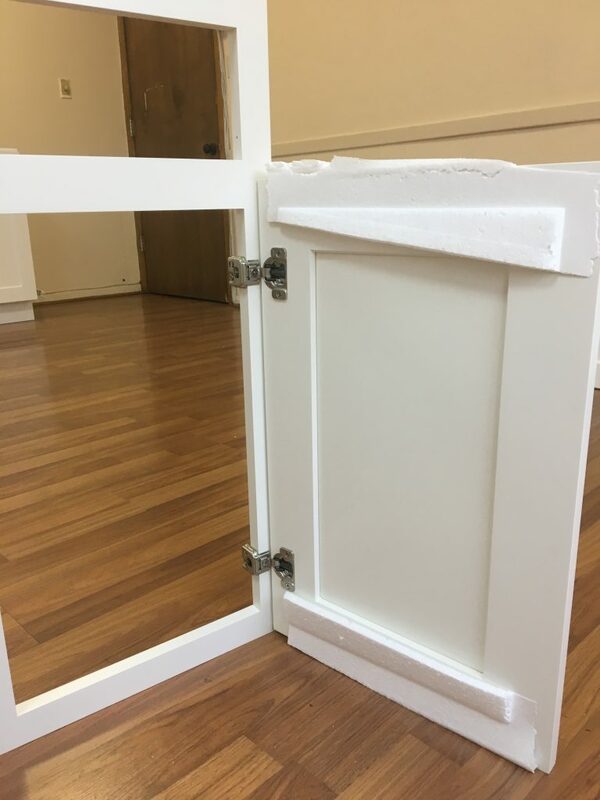 While these plastic corner braces do provide an added measure of security, the cabinet is stable without them due to the quality of the plywood, the full back panel, and the number of brackets. 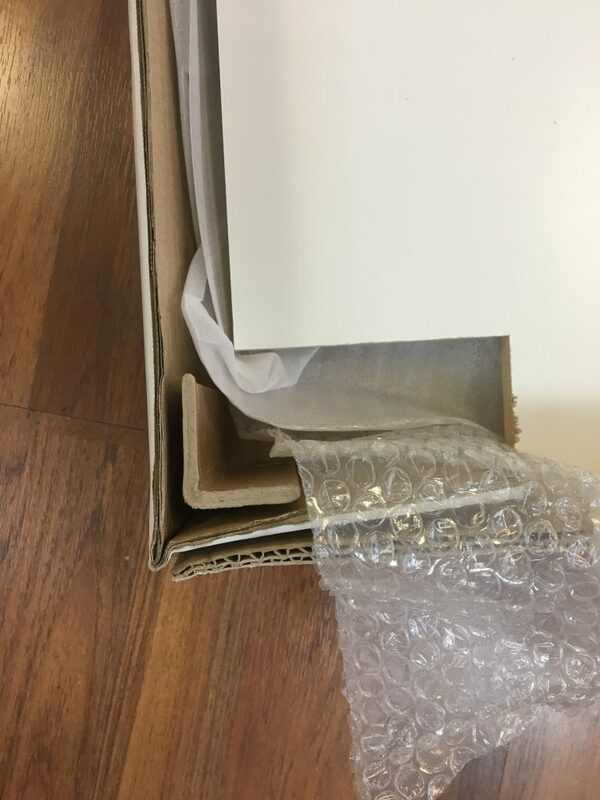 The Frosted White Shaker touts excellent packaging, with strong cardboard runners protecting either side of the exterior shipping package (Picture 30–below, left). 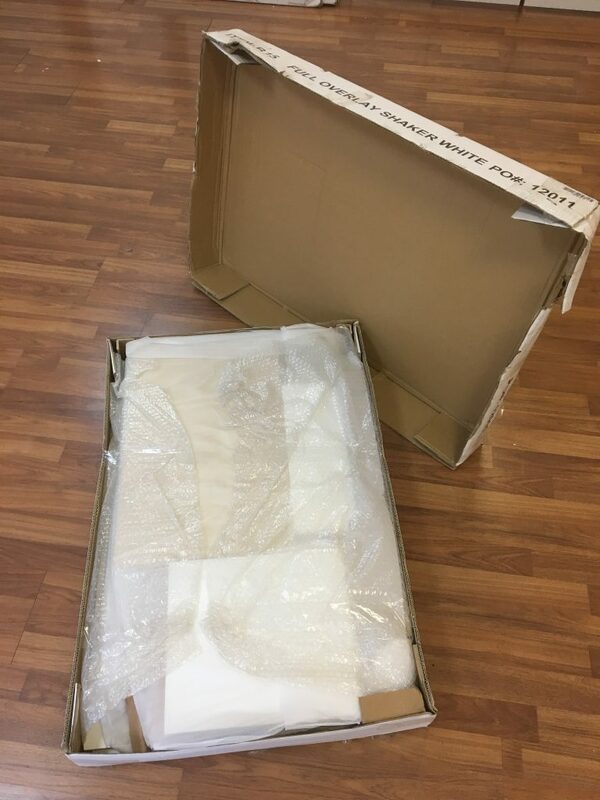 These undeniably add some necessary protection, as most RTA cabinets are shipped in a single, heavy parcel that can be difficult to carry or handle. 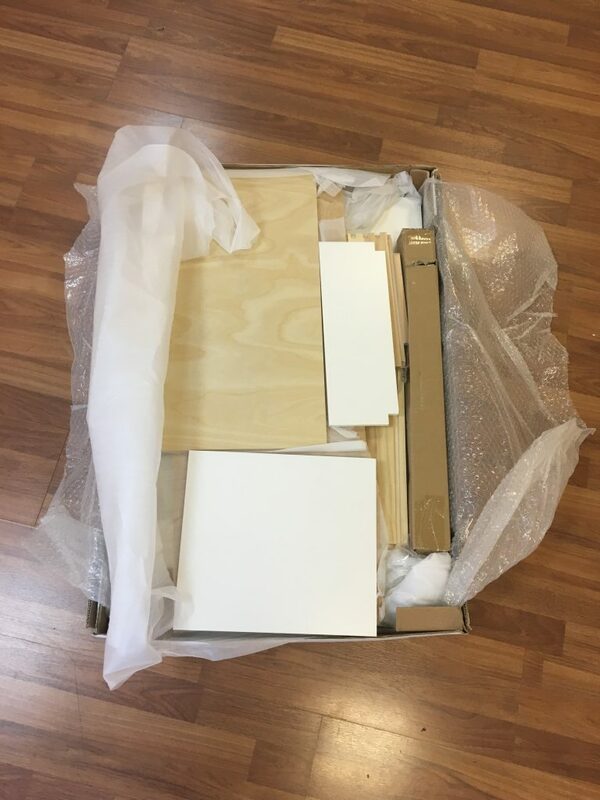 Once the protectors are removed and the box is open, the pieces of the Frosted White Shaker can be seen neatly organized and wrapped in Styrofoam sheets, separated by larger, thicker Styrofoam blocks (Pictures 31, 32–below, middle left and right). 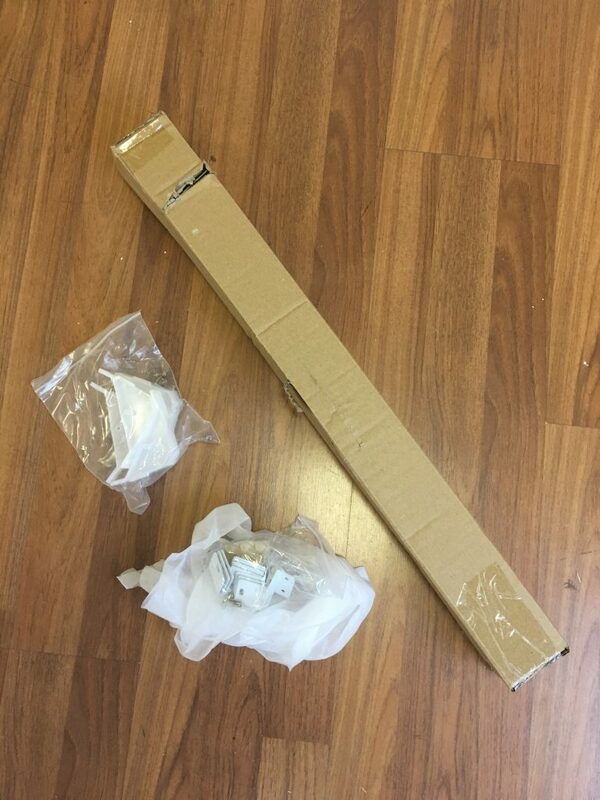 Each of the four corners inside the package has supplementary hard cardboard corner pieces to further protect the cabinet during the shipping process (Picture 33–below, far right). 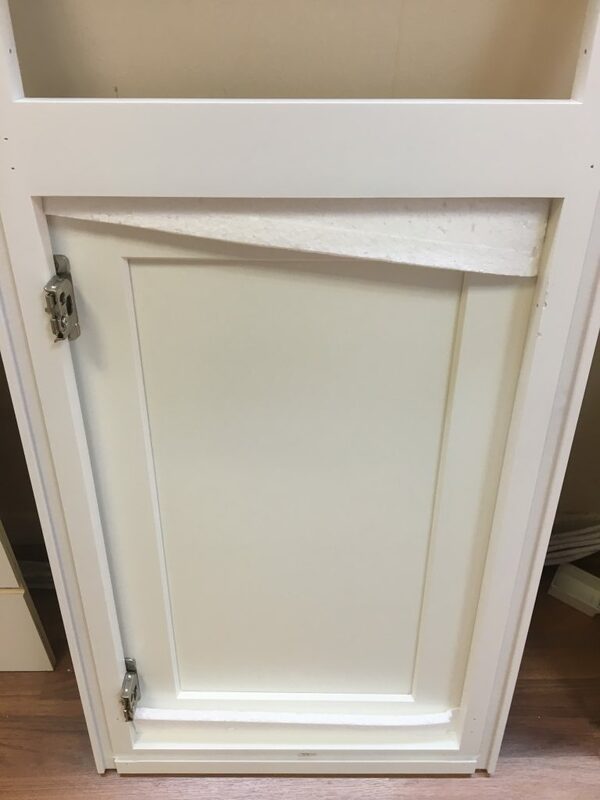 As mentioned at the beginning of this review, the Frosted White Shaker is shipped with the door pre-attached to the frame with the drawer face included and wrapped separately in a thick plastic (Picture 34–below, left). 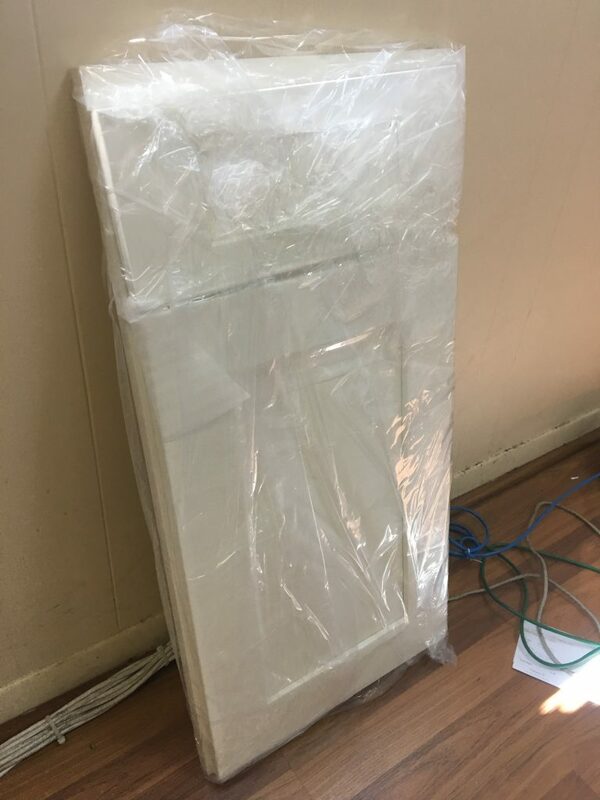 A detail of the packaging that strikes me is that the door has thick Styrofoam sheets between the inside of the door and the frame of the cabinet (Pictures 35, 36–below, center and right). 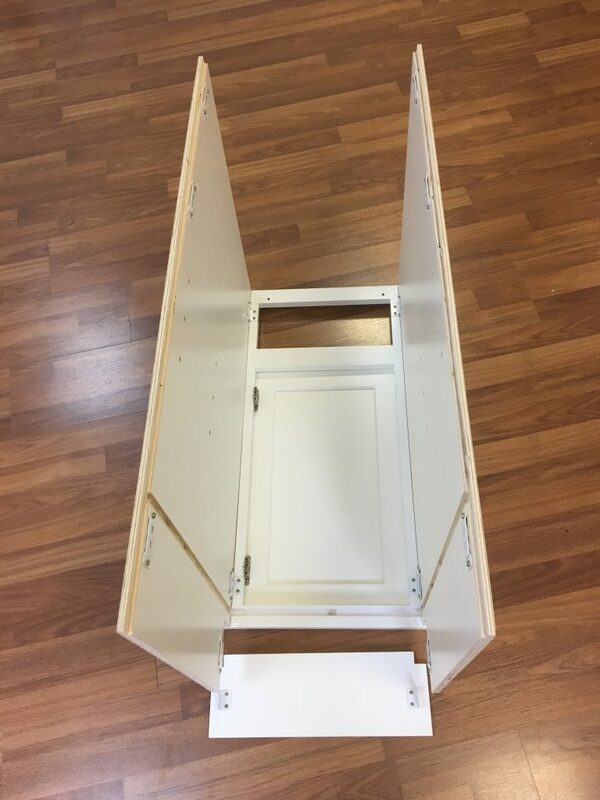 This is unique and catches my eye because it illustrates the manufacturer has gone above and beyond to provide protection in the transportation of the cabinet. The hardware also has extensive and impressive measures taken to protect the glides, anchors, “L” brackets, and plastic corner braces (Pictures 37, 38–below, left and right). As can be seen in the pictures, these pieces are all well organized and separated in individual bags. The only area where the Frosted is docked in this category is the lack of instructions or a guide included with the unit. With minimal tools required and the accessibility of the “L” brackets, the Frosted White Shaker is a straightforward assembly. There are moments in the build where a rubber mallet is required in order to gently tap the side panels into place, but the pre-attached door and full back-panel contribute to the simplicity of assembly (Picture 39–left). I am drawn to the lack of tongue-and-groove technique with this cabinet, as the “L” brackets snap the back panel into place and quality of the plywood work together to make this a sturdy cabinet, even more so with the plastic corner braces (Picture 40–right). 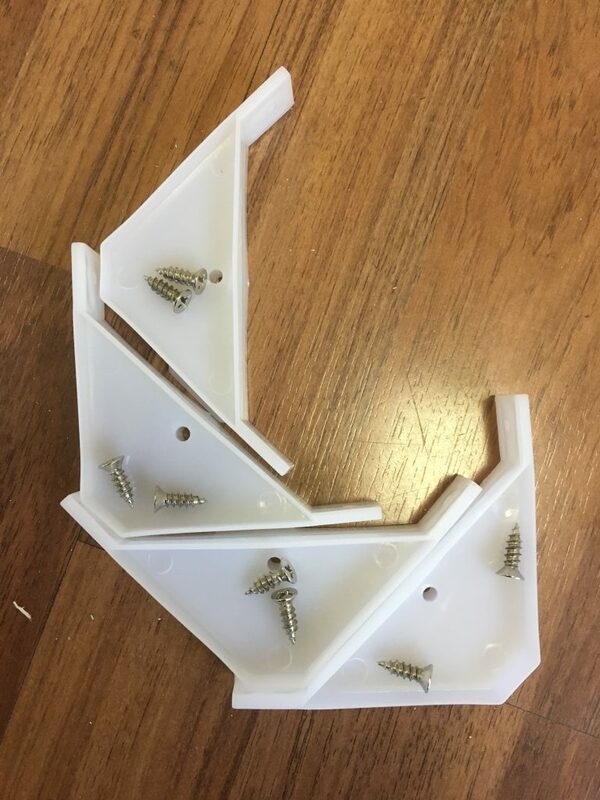 Unfortunately, because of the lack of instructions coupled with the sheer number of different sized screws and parts, the score in this category suffers. 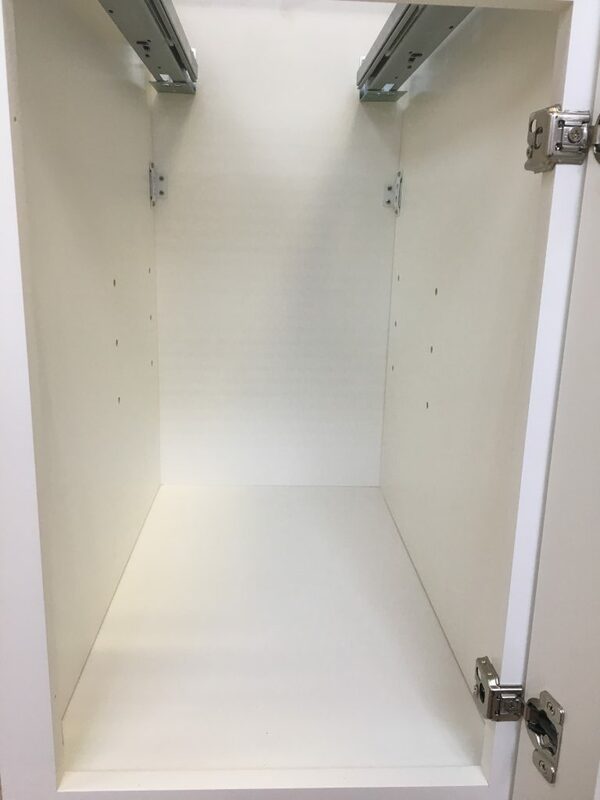 RTA Cabinet Store offers a wide variety of White Shaker models on their website, and the site itself is easy to navigate between these lines. No live chat is available but the option to leave a message with their Customer Support team exists. Each time I have attempted to leave a message, it has taken several days for their team to return my enquiries. When they do respond, they are accommodating and want to assist. I have attempted to call on several occasions and find myself speaking with a machine more times than not. They are willing and quick to send replacements when you finally get ahold of them. Quality interior paint and finish to match the exterior door and frame, both of which had minimal issues. Plywood touting so few discrepancies, the only place I found issues were the bottom panel of the box—still instrumental to the sturdy build of the cabinet. 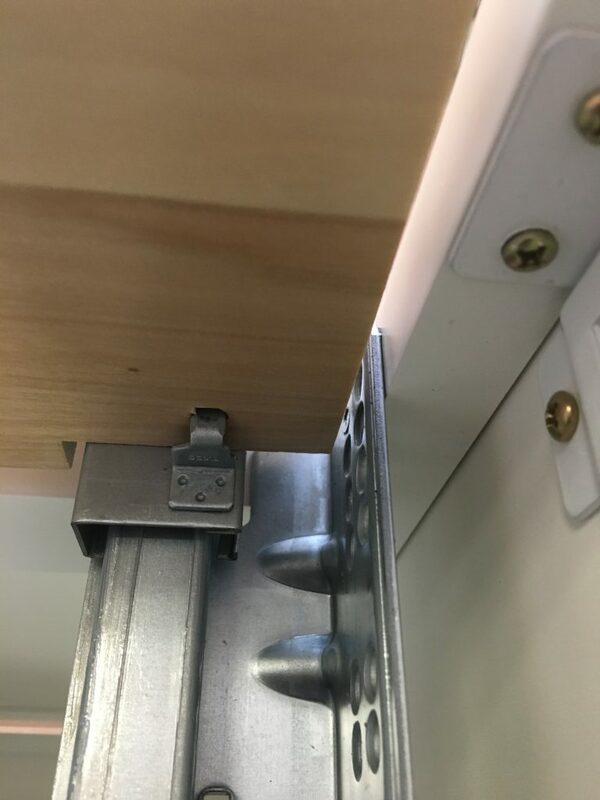 Metal drawer glide anchors making the drawer remarkably stable. Elaborate packaging that cuts no corners in ensuring the safety of the product. 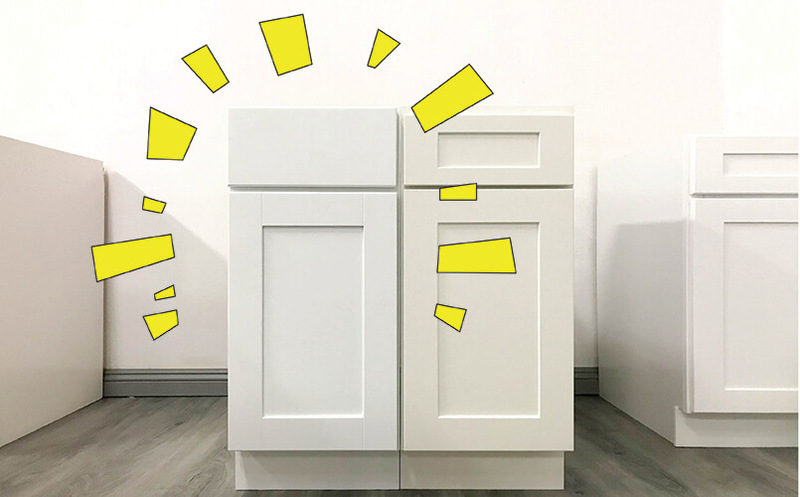 The finish of the cabinet, both interior and exterior, is not a pure white but a slightly softer, egg-shell white in tone. 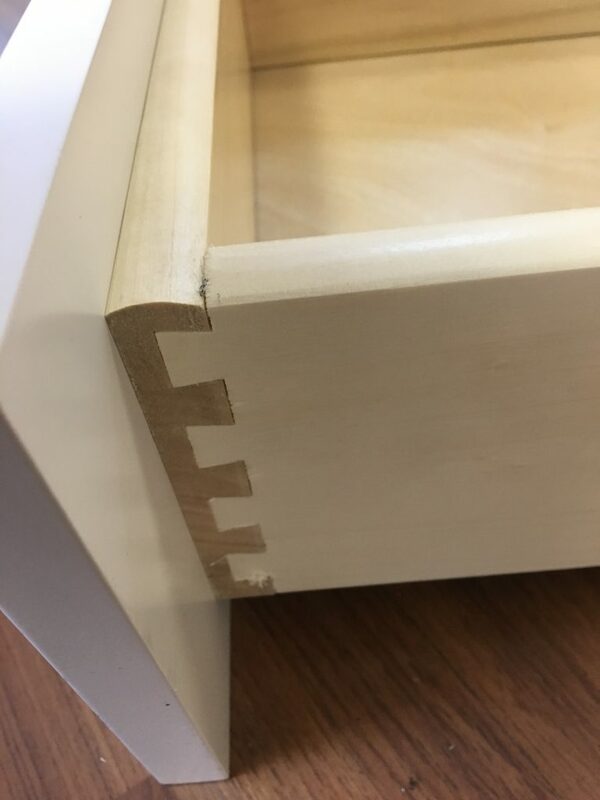 The inadequate thickness of the bottom panel in the drawer box, causing the screws provided with the plastic clips to protrude up through the wood. 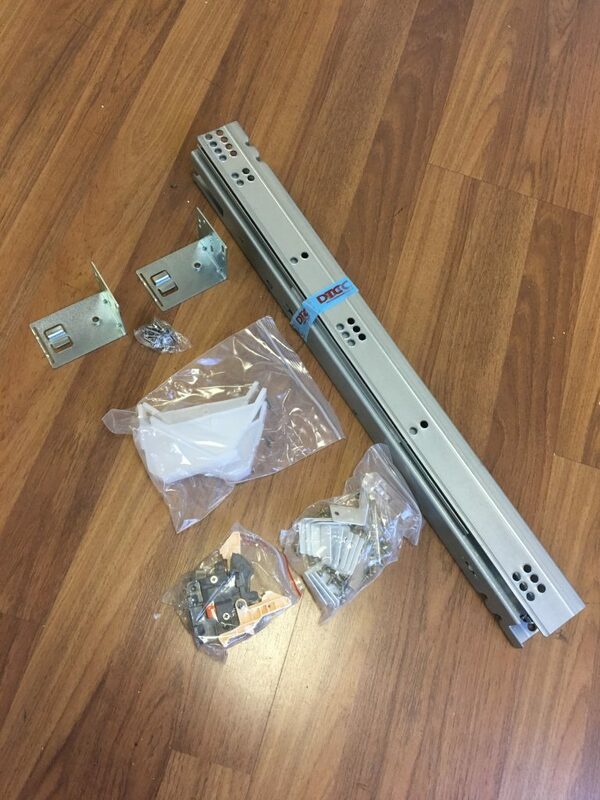 The complete lack of instructions is always a major negative for a unit, as every unit is slightly different and some form of guide or instructions can save someone a lot of headache in the event he or she is unfamiliar with cabinet assembly. 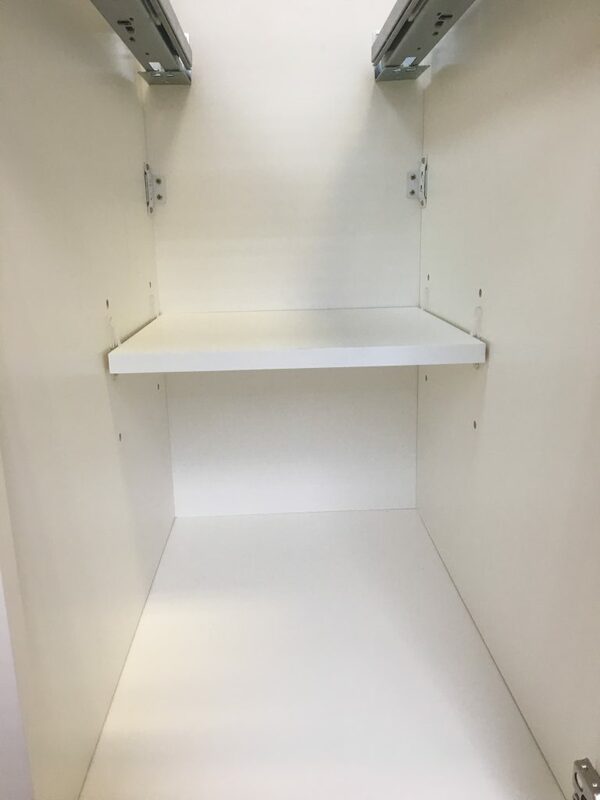 At a retail price of $167.48, the Frosted White Shaker is one of the three more expensive cabinets offered by the RTA Cabinet Store. With strong metal drawer glide anchors, quality plywood, and an even paint application and finish, if you are unconcerned with a White Shaker cabinet that isn’t a true white then the Frosted White Shaker should undoubtedly be a contender in the running for your needs.